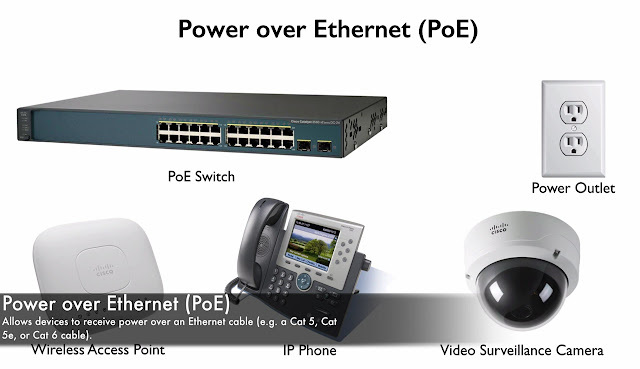 Now the we talked about the theory of an “Etherchannel”. Let’s see how to configure. Specifically, in this topic, we gonna configure a layer2 Etherchannel. 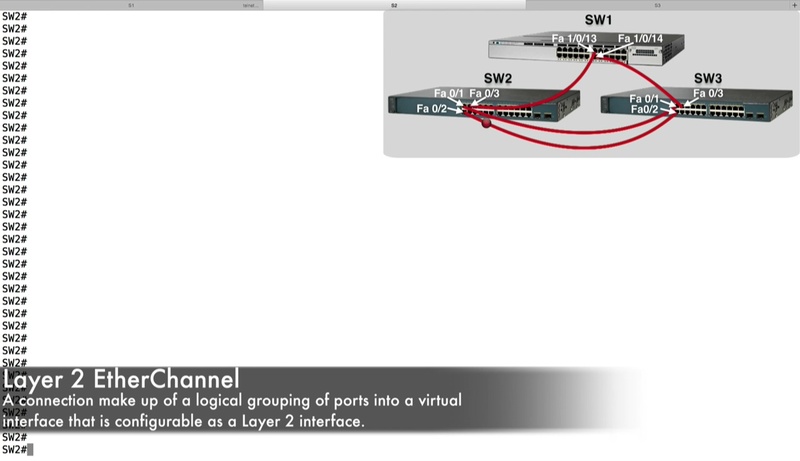 And by layer2 means that “the logical port we going to create, it’s going to appear like, it’s a switch port”. We can do layer2 things with it, for example, we gonna set this port up to be a “Trunk Port”, that would be a great fit to carry traffic for multiple Vlan’s, like we have the trunk and, what we wanna to do specifically is, we want to setup an Etherchannel within switches SW2 and SW3.We going to go in the ports “fastethernet 0/1 and fastethernet 0/2” on each switch, and we gonna have those ports, that needs switch be logically bundle together in an Etherchannel. 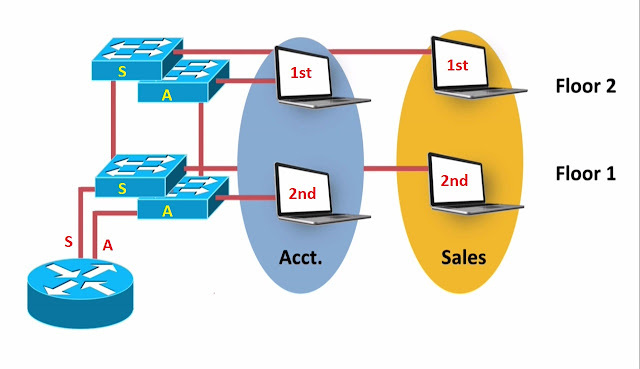 Let’s get started on Switch SW2, and you might remember that, we should first make sure that these ports in each of Etherchannel agree on a few things. MDI-X: - Most of our modern cisco catalyst switches support “MDI-X, Medium Dependent Interface Crossover”. That allows a switch port to automatically determine, which pins need to be transmit and which pins need to be receive. We gonna use pins “1, 2, 3 and 6” in our “RJ 45 Connector”, and by using “MDI-X”, a switch can determine the pins, “1 and 2 need to my transmit pair or my receive pair” and, the “pins 3 and 6 need to be my transmit and receive pair”. The Switches worked out between themselves and, we get to use a “Straight-Through Cable”. 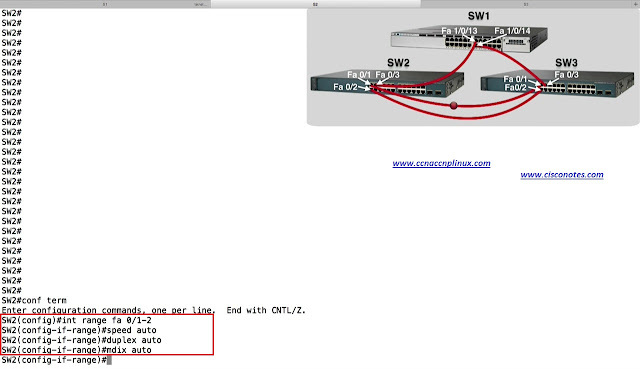 In order to setup “MDI-X” on our Cisco catalyst switches, the ports need to be configured for “Auto Speed” and “Auto Duplex”, that’s what we want to do. 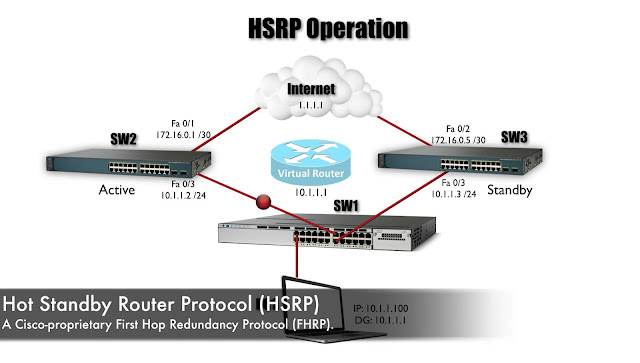 Let’s say, we will use “PAGP”, let’s make switch SW2 be in a “Desirable Mode”. These 2 ports will actively be sending “PAGP Frames”, trying to setup channel and, we have ports in SW3 in “Auto” mode. That don’t initiate the formation of a channel, but they were respond to the “PAGP Frames” coming from Switch SW2, and channel will be formed, and this will create a “Port-Channel”, and we have a “Virtual Interface” now. 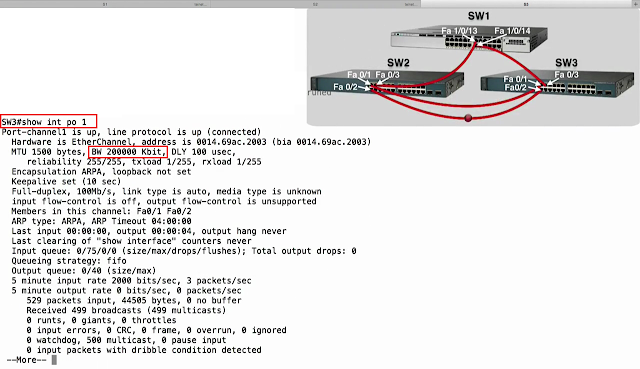 ü Because this is a “Layer2 Etherchannel”, we can treat this like, a regular Layer2 Port for example, we can set up trunk on this port, and I want to setup “Dot1q Trunk” between switches SW2 and SW3. 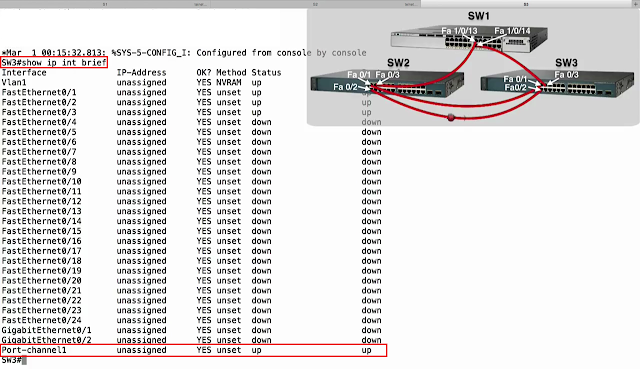 Now we done with our Configuration on SW2.Now let’s go over to SW3, and give the mirrored configuration. One big difference though on SW3, instead of being in “Desirable” mode for our channel, we wanna to an “Auto” mode. Now go to Port-channel interface Configuration. 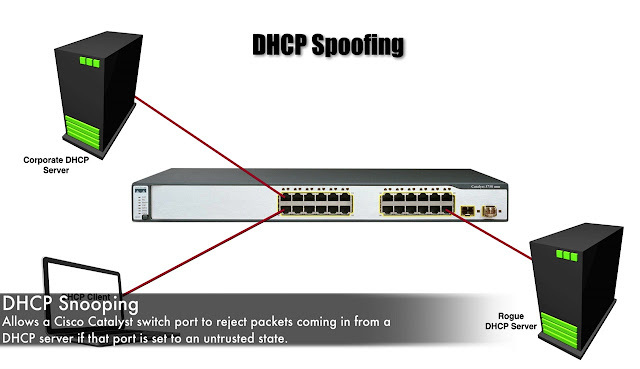 Let’s give some Verification command, we created an Etherchannel to interconnect these two switches and now we set it up a trunk, a “Dot1q Trunk” over that Etherchannel. And final things is , from the Perspective of the switch, it actually appears, we have a “200 Mbps Interface”. Check this out. Notice the “Bandwidth” “200000 Kbps” or another words (200 Mbps). It appears that, we got a “200 Mbps Port”, even though, we know which really made up of 2 physical ports, logically bonded together, to give us a “200 Mbps” link between these 2 switches.